Do you happen to enjoy puzzles? Do you also enjoy colourful environments? What about top-knots and loincloth wrestling belts? If you answered yes to at least one of the above, then you're probably going to have a great time with Pushmo, available for the Nintendo 3DS via the eShop. Yeah, this game is a little old. It's the very first game I bought when I got myself a 3DS (and I'm a Nintendo Ambassador), but it's one that I can always go back to. I feel like it hasn't gotten enough attention, so I'll attempt to remedy that with a review. How could I give you a review about a puzzle game and NOT think that the puzzles were fantastic? Well they are. One of the great things about Pushmo is that you start off small, you get some tutorials, and the puzzles are relatively simple. You have 3 levels on the Z-axis, and as you push and pull pieces, you can climb to the top and save a child who has been stuck in one of the many titular Pushmo. I'm not that big into casual gaming. I prefer to sit down with my 3DS or PSP and invest some time into a story, or some sort of progression that feels more rewarding than getting to level 127 of Candy Crush Saga. However, Pushmo somehow seemed to wrangle me in. I actually only bought the game because I had about $5 leftover on my eShop account, and I decided I'd spend it on something random. Like I had mentioned before, each puzzle should only take a few minutes (mind you, some of the later puzzles are head scratchers and can leave you staring at the dual screens for several more minutes). They also save immediately upon completion. That makes casual gaming with this a breeze. I often play Pushmo when I'm waiting for something. My train to arrive into the station, the kettle to boil, you name it. When I need to resume with whatever I was doing before, it's as simple as closing my 3DS. Progress saved. Pushmo looks great. It's nothing crazy, but it manages to be not too plain either. Normally in a puzzle game, no one really cares about backgrounds or what goes on around the puzzle, but Pushmo actually has some vibrancy to it. Pushmos are located in Pushmo Park, where the children play. Each Pushmo themselves are also bright and colourful. Some of them are even designed to be 8-bit pixel art. You'll see things ranging from fruits, to animals, to even Mario. 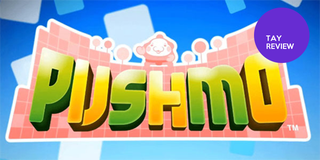 One word for Pushmo's music. Catchy. It's upbeat, and I often find myself humming it out loud for a little bit after playing the game. It's certainly not a full soundtrack, as there are few songs to listen to, but when you're staring at a puzzle for 10 minutes, the last thing you need is horrible music. This is something that most video games can be accused with. It's not even that it's too long, it's that it's too thorough. The game shouldn't take too long to explain, but it seems like they need to cover every small bit, and leave nothing to the imagination (during the tutorial of course). For those of you who have a 3DS and are looking for a light game to pick up, look no further (assuming you don't already have Pushmo). Each puzzle is relatively quick, but there are a TON of puzzles to play, so you'll still get quite the bang for your buck. I hope this review can get Pushmo more attention, as it's an amazing eShop game for the 3DS. It's even got a sequel called Crashmo, but we can talk about it another time.